Some of the biggest names from the most colorful section of the newspaper gathered at the Boston Center for Adult Education on Sunday for a reception for “One Fine Sunday in the Funny Pages,’’ which featured more than 130 comic strips published on the same day. VIPs at the event included “Red and Rover’’ creator Brian Basset, “Soup to Nutz’’ illustrator Rick Stromoski, “Kid City’’ comic Steve McGarry, and Jeff Keane, who works on the iconic comic strip “Family Circus’’ with his father, Bil Keane. The “Family Circus’’ character Jeffy is based on Jeff. 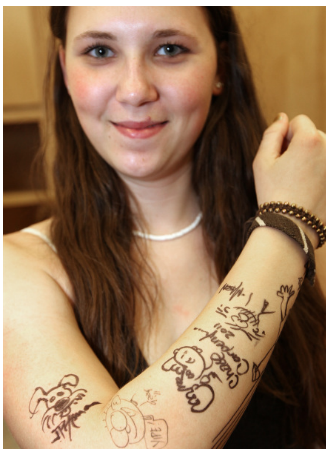 One funnies fan, 17-year-old Jennifer Parisi of Boston, made rounds at the reception and asked every comic strip illustrator she could find to sign her arm. By the time we found her, she was up to 10. What Names didn’t know or didn’t care to note: Jennifer Parisi is the daughter of local comic-strip artist Mark Parisi, creator of the reliably offbeat Off the Mark. But this much is certain: Mark Parisi and Darby Conley are getting short shrift from BCAE and the Globe. Hey! Short Shrift – good name for a comic strip? This entry was posted in Uncategorized and tagged BCAE, Boston Globe, Darby Conley, Get Fuzzy, Jennifer Parisi, Mark Parisi, Names, Off the Mark, One Fine Sunday in the Funny Pages, Short Shrift. Bookmark the permalink. Okay, as the guy who actually pulled together the “One Fine Sunday” exhibit, allow me to address your “short shrift” comment. While I can’t speak for the writer of the Globe article, I can assure you that the Boston Center for Adult Education had nothing to do with what you wrongly accuse as the snubbing of Parisi and Conley. Every cartoonist whose work is part of the show (and several who are not) was contacted by me personally, and EVERY one who actually sent me their original art (for their April 11, 2010 comic) was represented in the Boston exhibition. And, for the second time – I responded about this to your previous post about the show at BCAE – Mark Parisi’s comic IS in the show and Mark Parisi WAS there at the reception that Sunday. Again, Mr. Read, I stood corrected on my initial post; I had incomplete information (the original Globe piece and a press release) to go on, and I was happy you clarified the situation in your initial comment. But also again, the “More ‘Funny’ Business at the Boston Globe” post was just that – about the GLOBE COVERAGE of the reception. I can understand your sensitivity about criticism, but that post had nothing to do with you. And finally, also again, I’m looking forward to seeing the exhibit soon.